On average, students on ScootPad are achieving 156% Rate Of Learning (ROL). ScootPad’s Rate of Learning algorithms are real-time and based on data collected across multiple data points for over a million students. It represents the average pace at which students master concepts relative to their grade level. Today’s post will cover what this means for student learning and how it can help you measure your students’ progress. Use the Rate of Learning chart to see how your classroom and school compare to other classrooms on ScootPad across both math and reading. On average students on ScootPad learn 1.56 times more than a student not using ScootPad, which means an average 3rd grade student would master all of 3rd grade and 56% of the 4th grade concepts. Our new Rate of Learning Report lets you see where in the class each student stands in both Math and ELA/Reading. Use this report to compare students, identify who might need more practice or extra help mastering concepts and accelerate student learning. 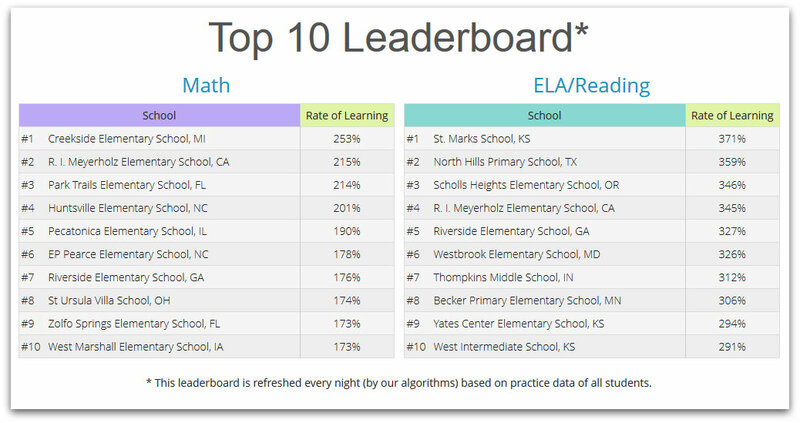 Our new Top 10 Leaderboard shows the schools with the highest Rate of Learning for both Math and ELA/Reading. Use this Leaderboard to motivate your kids to master more concepts and push your school to the top! School-Level Proficiency Reports Now Available!